I arrived in British Mandatory Palestine in Oct. 1947, as an American student, for what was intended to be a year of study at the Hebrew University in Jerusalem. But, caught up in Israel's War of Independence, I joined the underground Haganah defense forces, served as a medic in the siege of Jerusalem, and later in the nascent IDF and the fledgling Israel Air Force. In letters I wrote to my family at that time I described vividly the historic events as they were happening. 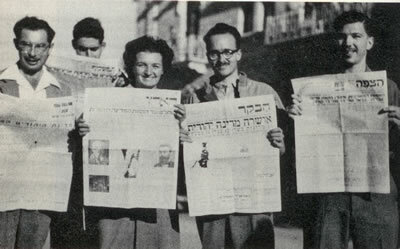 The letters were found many years later and published in a book, "Letters from Jerusalem 1947-1948". This letter, written the morning after the United Nations voted to approve the Partition of Palestine, paving the way for the establishment of a Jewish State, describes how Jerusalem went wild with joy on Nov. 29, 1947. I walked in a semi-daze through the crowds of happy faces, through the deafening singing, "David, Melech Yisrael, Chai, Chai ve Kayam" [David, King of Israel, Lives, Lives and Exists.] past the British tanks and jeeps piled high with pyramids of flag-waving, cheering children. I dodged motor cycles, wagons, cars and trucks which were racing madly up and down King George V Street, missing each other miraculously, their running boards and headlights overflowing with layer upon layer of elated happy people. I pushed my way past the crying, kissing tumultuous crowds and the exultant shouts of "Mazal Tov" and came back to the quiet of my room ....to try to share with you this never to be forgotten night. The light in my room was still on from last night. I had planned to go to sleep early since rumor had it that voting at the UN on the Partition Plan would probably be postponed for another day. But, at about 11:00 p.m. there was a knock on the door, "We're getting through to America. Come on down. The voting's tonight." Ten pajama-clad bodies crowded into a room with space enough for five and sat tensely round the battered radio for what seemed like hours while vain attempts were made to get clear reception from Lake Success. We got through just as the announcement of the majority vote was made: thirty-three in favor, thirteen against and ten abstentions. Ecstatic, we hugged and kissed each other frantically, then stood rigidly at attention and sang hatikvah fervently. Out came bottles of wine, biscuits and candy. We ate and drank and held a solemn little ceremony, then dashed to our rooms, hurriedly slipped on whatever clothing came to hand and banged on all the doors to wake up those who had slept through the good news. All the students in the building scrambled up to the roof and, under the warmth of moon glow and wine, danced deliriously. Then we made a snake line to the nearest houses, banging on the shutters and doors, shouting the news as we went. In a seemingly endless column, we wound our way to the next community, Bet Hakerem, where the Teachers Seminary is and most of the students live. The streets were already full, ring upon ring of dancing groups, circling in a frenzied Hora. Ours was the last and largest circle. Arms linked, marching six abreast, singing all the way, the battalion of students advanced, shouting the news to neighbors who poked their sleepy heads out of windows and doors to see what the commotion was about, straight to Hamekasher the bus terminal. Confronting the watchman with the news, we demanded a bus to take us to town. He was so excited he provided three. In a mad scramble we piled in, body on body; down the road we raced like a million hearts on fire, headed for the heart of Jerusalem. The streets in the city were beginning to fill as the news got around. People poured out of their homes in a continuous ever - thickening stream. In the center of town crowds of happy people, hugging each other, dancing Horas and jigs, headed spontaneously, as we were -- drawn by some magnetic force -- to the courtyard of the fortress-like Sochnut (Jewish Agency) building, which for years housed the hopes for a Jewish State in Palestine. Out came a flag and onto the balcony came Golda Myerson [Meir]. There were no words to suit the moment. Choked with emotion, she managed to say Mazal Tov and down came tears, oceans of unrestrained happy tears. All night streams of joyful crowds assembled in the courtyard mulling in and out...to pay homage, to give vent to exultant incredulous feelings that welled up from deep inside. A group of us marched to the press room of The Palestine Post" [now The Jerusalem Post ] to get the latest news from Morty and Dov our friends who work there. Another round of drinks and embraces and crazy dances while we waited for the historic First Edition to come off the presses. At four-thirty in the morning, flushed with excitement, ignoring the wet ink, we passed our copies around for everyone to autograph, including an English Tommy who wandered in for a drink. Then Morty, Dov, Milt and Ray, and I and several student friends who had come with me, headed back to the Sochnut building, just in time to see a streak of warm beauty spring up out of the horizon and smile good morning to us. We looked at each other, drew closer together, wrapped arms about each other's chilled shoulders and felt the thrill of experiencing a historic wonder, dawn bidding Shalom [Hello] to a Jewish State. Our group consisted of about fourteen fellows and a few girls, from about as many countries. We made our way singing to Morty's room, not far away, where we found the landlord so elated he didn't know what to do for us first. Ever the practical person, I suggested food and prepared sandwiches, fruit and coffee while we drank yet another "LeChaim". Leaving the house, we were met by scores of morning crowds, some hangovers from the night before, some fresh out of bed, kissing and embracing and shouting "Mazal Tov." And as we rounded the corner into Keren Kayemeth Street, where the Sochnut is, whiz came the motor cycles, lorries, cars and the children, now awake, and took up the gaiety where we had left off. Spontaneous parades formed, led by a flag bearer and a couple of drunken British soldiers -- this time, thank goodness, unarmed. The sun was getting warmer and warmer, a glorious day. The end of November and seventy-five degrees of heartwarming sunshine was bearing down on a happy city. The foreign correspondents and Pathe men were on the job photographing the British tanks which were suddenly converted into flying transport for anyone who could climb aboard, sing, shout and wave a flag. We joined the crowds, going from one end of King George V Street and Jaffa Road to the other, meeting friends and fraternizing with the English soldiers who were as happy as we were about the end of tension and ill feeling between us. All they wanted was to go home. With each round we ended up at the Sochnut again, every crowd did. Rumor had it that Ben-Gurion had just arrived from Tel Aviv and would make a personal appearance. Sure enough, there he was, standing on the balcony of the Sochnut building. He looked slowly and solemnly around him -- to the roof tops crammed with people, to the throngs that stood solid in the courtyard below him. He raised his hand: an utter silence waited for his words. "Ashreynu sheh zachinu la yom ha zeh. " [Blessed are we who have been privileged to witness this day.] He concluded with "Tchi ha Medina ha Ivrith," [Long Live the Hebrew State -- it didn't have a name yet] and called for Hatikvah. A solemn chant rose from all sides. The moment was too big for our feelings. There were few dry eyes and few steady voices. Ben-Gurion tossed his head back proudly, tenderly touched the flag that hung from the railing and charged the air with electricity when he shouted defiantly, "WE ARE A FREE PEOPLE." How I wished you could have heard his words and been here for this memorable night and never to be forgotten morning. It was too unbelievable. Making	my way to the bus to go home for a camera and a wash, I noticed that all the cafes and wine shops had flung open their doors -- drinks on the house. Flags were hoisted everywhere and shopkeepers had decorated their windows with photos of Theodor Herzl, whose words have inspired and sustained Zionists until this day, "If you will it, it is no dream." Now that it was happening, it seemed more than ever like a dream. My heart was bursting from joy. Later that night... I grabbed my camera, changed clothes and joined my friends to return to the city and the excitement. Notices were already prominently displayed announcing a mass meeting to be held in the Sochnut courtyard at three in the afternoon, and a very impressive affair it was. We had already heard that there were incidents on the road from Haifa to Jerusalem. The crowds were more sober and, when told to, dispersed in an orderly and disciplined manner, everyone going to his own home and his own family celebration. We had ours too, then a hot bath and off to sleep, trying to make up for about fifty non-stop hours of delirium. 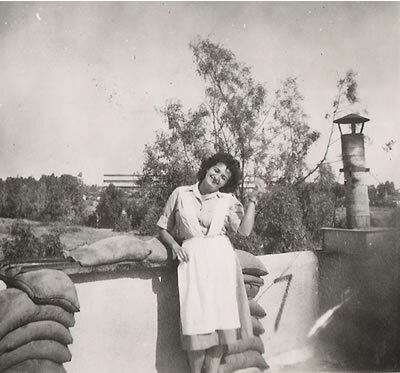 IAF nurse in Israel's War of Independence. From the roof of the hospital, I watched this morning's parade, a parade of soldiers of the Jewish State. Not partisans or underground fighters. Soldiers, standing erect and proud, in rain puddles six inches deep, wearing shabby outfits -- winter uniforms still haven't reached us -- listening to lofty words of accomplishment and tribute. I, too, listened but my thoughts wandered -- drifted back to last November 29th, 1947, Jerusalem, the courtyard of the Sochnut building, the spontaneous joy that filled the streets when the United Nations resolution calling for a Jewish State was approved. And now we march, we form ranks, we listen to speeches, we salute officers: Natan, as they taught him in the Russian army; Lev, as he learned in the RAF; Aryeh, as they do in the Polish army; Uzi (the Sabra), reluctantly; Moshe, in Turkish style. All of them, saluting the Jewish Officer in Command, representing Tzva Haganah LeYisrael (Israel Defense Forces). The same people who were partisans last year are soldiers today, and civilian citizens of the State of Israel tomorrow. I wondered whether "tomorrow" would be another year or an eternity? The command rang out, "Chofshi" (dismissed). The ranks broke to the count of three and everyone dashed to the canteen where they mimicked each other marching, saluting and even drinking tea. Nobody mentioned the words we had heard, nobody referred to the historic importance of the day or the momentous events that had transpired, transforming us into a State with an Army. Nobody marveled at the wonder of it all. Were these miracles already being taken for granted? For me, this pathetic parade was a fulfillment, a consummation. I kept thinking that it had been mustered from all the lands of the world, had taken not one year but two thousand years to materialize. Next year, the parade will probably be more impressive. We'll have smart uniforms, everyone will salute in the same way, stand in straight lines and know all the marching commands. We will have learned so much and, possibly, forgotten so much. The talk in the canteen was about leave time, the latest movie, tonight's party, who had an extra blanket or what's the biggest gripe of the day. I looked at the faces of those around me and thought of the patriots who had fought the American Revolution. Faced with a Fourth of July celebration 1948-style, would they have the same sober thoughts I was having? the twenty-ninth of November is just a red-letter day on the calendar. A fighting people hasn't time to be sentimental. But I couldn't help thinking of Moshe, Oded, Zvi, Amnon, Yaakov, Aryeh, Matty, Nachum and a hundred others in Jerusalem, who a year ago danced and sang through the night with me, but didn't live long enough; they fell before the dream came true. The lump in my throat was too big in my mouth. Was it only a year ago? No, it was worlds ago, each a separate world: the University, the Haganah, Deir Yassin, the Burma Road, Sheikh Jarrah, Katamon, Talpiot, Tel Aviv, Haifa -- worlds of people, places and events. I can't believe this year. So much has happened, but the most important thing by far is the birth of the State. I've been part of it and it will forever be part of me. I guess that means I am telling you I intend to see this war through and then remain on, whatever happens. This is now my HOME.